‘I had a carefree, fun-loving attitude towards life, ‘Hum hain raahi pyar ke hum se kuchh na boliye, jo bhi pyar se mila hum usi ke ho liye’. I believe that Love should be an integral part of everyone’s life as ‘Zindagi pyar ka geet hain, usse har dil ko gaana padega’. Although I haven’t been as lucky as Sourav Ganguly, but like him, I also once had an eye for a ‘padoson’ and used to sing for her ‘Mere saamne wali khidki mein ek chand ka tukdaa rehta hain’. About my dream girl, I’d ask curiously ‘Mere sapno ki raani kab aayegi tu?’. I’d long for a sweetheart…. In those days, often I’d come across a beautiful girl somewhere and when I’d meet my friends later, I’d tell them ‘Ek ajnabi haseena se yun mulaqat ho gayee’. I couldn’t concentrate on my studies as she’d keep coming back to my thoughts and I’d wonder ‘Khawab ho tum ya koi haqeekat, kaun ho tum batlao’. I’d lose sleep over her and could only think about her – ‘Dream girl, ek shayar ki gazal Dream Girl…kabhi toh milegi..aaj nahi toh kal’. Wherever I look, I could only see her – ‘Jidhar dekhu teri tasveer nazar aati hain’. I could think about her the whole day without anything else getting done – ‘Gum hain kisi ke pyar mein dil subah shaam’. Then out of the blue, I’d see her again in some social get-together, but ‘Mehfil mein kaise keh de kisi se, dil bandh raha hain kisi ajnabi se’? There was some occasional cases when another guy was wooing her too, but that didn’t deter me to challenge him with ‘Aa dekhe zara, kiss mein kitna hain dum’. Obviously the girls being the ‘Simti si sharmayee si’ types, often the guys have to patao them. ‘Maana janaab ne pukara nahi’, but you have to take the initiative to find out whether ‘saath humhara gawara nahi’ or not. If the girl was rude or arrogant, then I’d tell her ‘Kitne bhi tu karle sitam, hans hans ke sahenge hum, yeh pyar na hoga kam, sanam teri kasam’ or ‘Dilbar mere kabtak mujhe aise hi tadpaoge’. Sometimes, she’d be mad with my antics, but my logic would be ‘Gussa itna haseen hain toh pyar kaisa hoga?’. It didn’t matter whether we spoke the same language or not, I was able to convey my feeling for her in any language through the song ‘Angrezi mein kehte hain’. The ‘peecha’ would continue with songs like ‘Tere peecha na main toh chhodunga soniye’, ‘Chahiye thoda pyar, thoda pyar chahiye’, ‘Pyar maanga hain tum hi se, na inkaar karo’ and ‘De de pyar de’. I’d try to woo her by telling her ‘Humeh tum se pyar kitna yeh hum nahi jaante, magar jee nahi sakteh tumhare bina’ and ‘Humeh aur jeene ki chahat na hoti, agar tum na hoteh’. If the girl was way too beautiful and a bit ‘ghamandi’ because of that, then I’d have to tell her ‘Dil ko dekho chehra na dekho’. If she still wouldn’t agree, then I’d say her goodbye with ‘Mere naseeb mein aye dost tera pyar nahi’, but how could I pacify myself as ‘Dil kya karen jab kisi pe kisi ko pyar ho jaaye’?. On other occasions, she’d take pity on me and agree to a date and I’d go ‘Aaj unn se pehli mulaqat hogi, phir aamne saamne baat hogi’. Of course I won’t use the antara like ‘andekha anjana chehra’, but this song was perfect as that’d be the first time I could talk to her ‘aamne saamne’. I’d be somewhat nervous too for the first date as I’d sing ‘Dil dhak dhak karne laga’. Sometimes, if the girl had brothers, then there would be even further troubles. The protective brothers would threaten me and I’d sing ‘Dekha na hai re socha na hai re rakh di nishane pe jaan’. But if it’s smooth sailing without any ‘kabab mein huddi’, then it’d be ‘Pal pal dil ke paas tum rehti ho’. Eyes are one of the important aspects that I notice in a girl and I’d say ‘Aakhon mein hum ne aap ke sapne sajaye hain’, ‘Yeh naina yeh kaajal, yeh zulphen, yeh aanchal’ and ‘Aap ki aakhon mein kuchh mehke huye se raaz hain’. For a date on a ‘Chandni Raat’, I’d sing to her ‘Chandni raat mein ek baar tujhe dekha hain’ and ‘Chehra hain ya chand khila hain’. Often I’d drop her home after a date and tell her ‘Bye bye Miss goodnight, kal phir milenge’. And on my way back home on a moonlit night I’d go ‘Thandi hawa yeh chandni suhani, aye mere dil suna koi kahani’. Sometimes, she’d be late for the date. I’d be irritated like hell, but KK will keep me company with songs like ‘Inteha ho gayee intezaar ki’. A date near the sea would always remind me of ‘Saagar kinare, dil yeh pukare tu jo nahi toh mera koi nahi hain’. Not only the dates, but those love letters too…I’d wish that ‘Phloon ki rang se, dil ki kalam se, tujhko likhi roz paati’. Once I was invited to her house. I was excited and told her ‘Shayad teri shaadi ka khayal dil mein aaya hain, isi liye mummy ne teri mujhe chai pe bulaya hain’. But unfortunately, I was told to lay off. Mom would ask me to concentrate on my studies, but I’d think ‘Aanewala pal jaanewala hain, ho sakeh toh uss mein zindegi bita doh pal toh yeh jaanewala hain’. As usual, there were gossips about us in the locality, but ‘Kuchh toh log kahenge, logo ka kaam hain kehna, chhro bekaar ki baaton mein kahi beet na jaaye raina’. But on a few occasions, we’d feel like ‘Chal kahi durr nikal jaaye’ to get away from these nasty people. There were heartbreaks too and during those days, songs like ‘Badi suni suni hain’, ‘Koi hamdam na raha’, ‘Jeevan ke safar mein rahi milteh hain bichhad jaane ko’, ‘Leheron kia tarah yaaden, dil se takrati hain’, ‘Dil aisa kisi ne mera toda’ etc. used to give me company. I’d plead with her not to break up my heart as ‘Chudi nahi yeh mera dil hain’. I’d wonder ‘Yeh kya hua, kaise hua, kiyun hua’??? I’d cry for hours after a break-up, ‘Mere naina sawan bhadon, phir bhi mera mann pyasa’. I’ll tell her ‘Tere bina zindegi se koi sikwa nahi’ and tell myself ‘Dukhi mann mere, sunn mera kehna’. My friends would stand by me and they’d say ‘Ruk jaana nahi tu kabhi haar ke, katon pe chal ke milenge saaye bahar ke’ and soon I’ll be back to normal. A friend in a need is a friend indeed because ‘Diye jalteh hain, phool khilteh hain, badi mushkil se magar duniya mein dost milteh hain’. Once I’d become normal, the same dream would come back again…with another girl this time, ‘Phir wohi raat hain, phir wohi raat hain khwab ki’, with another girl this time – ‘Jab bhi koi kangna boleh, payal chhanak jaaye’. If I had to call off the relationship for some unavoidable reasons, I’d tell her ‘Hum bewafa hargiz ne theh, par hum wafa kar na sakeh’ or ‘Teri duniya se hokeh mazboor chala’. When I look back, I still feel that ‘Zindegi ke safar mein guzar jaate hain jo makaam, who phir nahi aate’. But I have always believed in Love as I think ‘Pyar hi jeene ki soorat hain, sab se badi zaroorat hain, pyar se kya darna?’ Those memories are still so distinctly clear. ‘Woh shaam kuchh ajeeb thi, yeh shaam bhi ajeeb hain’. Those days of growing up is a thing of the past now and I do miss them sometimes. ‘Koi lauta de mere beetey huye din’. As far as my present life is concerned, I am always on the move, ‘Musafir hoon yaaron na ghar hain na thikana, mujhe chalteh jaana hain bas chalteh jaana’. Whenever ‘Gaadi bula rahi hain’, I move from one place to another but still believe that ‘Jeevan ke har mod pe mil jaate hain humsafar’. May be ‘Pal bhar ke liye koi humeh pyar kar le, jhutha hi sahi’. But yet, ‘Tanha main akela, toota taara koi’. I wish that ‘Koi hota jisko apna, hum apna keh lete yaaron’. But never mind, ‘Jiska koi nahi, uska toh khuda hain yaaron’. In the end, ‘Mera jeevan kora kagaz kora hi rah gaya’. Nobody understood my pain – ‘Main hoon ek paagal premi, mera dard na koi jaana’. This is the journey of life and nobody has completely understood it ‘Zindegi ka safar, hain yeh kaisa safar, koi samjha nahi, koi jaana nahi’ and it’s better if one can accept it just the way it is and go with the flow ‘Yeh jeevan hain, iss jeevan ka, yehi hain rang roop’. I still love life, ‘Kabhi palkon pe aansoon hain, kabhi lab pe sikawat hain, magar aye zindegi phir bhi mujhe tujh se mohabbat hain’! This entry was posted on Monday, May 6th, 2002 at 5:10 pm	and is filed under Bam Chika Bam Bam. You can follow any responses to this entry through the RSS 2.0 feed. You can leave a response, or trackback from your own site. The article on the greatest singer is great. 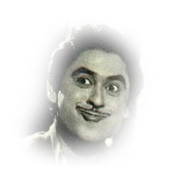 Kishoreda is my love,the greatest.